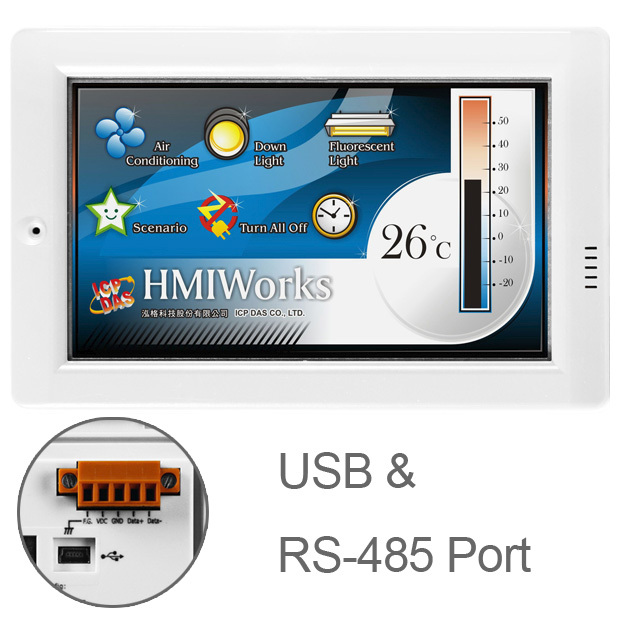 Touchpad 4.3" Touch Screen PLC / Touch Screen Controller with RS-485 and USB ports, Real Time Clock and fits in regular electrical wall mount outlets. Comes with Free HMIWorks C Language and Ladder Logic Programming and GUI Development Environment. Supports operating temperatures between -20 ~ +50°C (-4F ~ 122F). 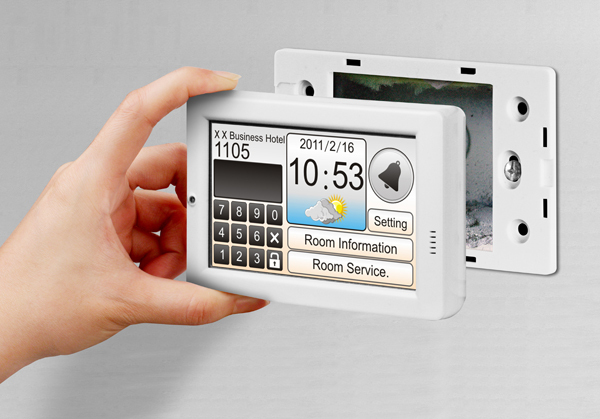 TPD-43x(-EU), TouchPAD, is a series of tiny touch screen HMI and designed for building and home automation. 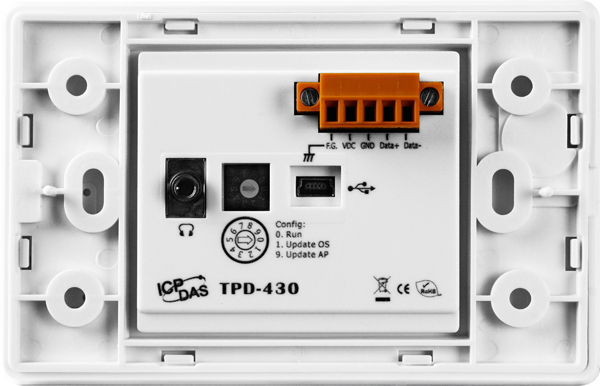 TPD-43x(-EU) is equipped with high resolution TFT color touch screen and fits in with regular electrical wall-mount outlet. Besides, it is seamlessly integrated with rich I/O modules and the touch screen presents beautiful, flexible and user-defined picture frame. With the high definition touch screen, users can easily control the devices at home and in the building and monitor their real time status through the touch screen. In short, touch Screen PLC's allow you to implement control and offer a user interface over Modbus communication protocol. Thus the touch screen controllers are the best choice to upgrade the mechanical switch to intelligent control pads. For PLC users, HMIWorks provides Ladder Designer, and for IT users, C language environment is provided with the TPD series touch screen controllers. It only takes no more than 30 minutes to learn how to create an application program of the TPD series touch screen PLCs when using Ladder Designer. With all the features provided, TPD-series touch screen HMI Devices is one the most cost-effective touch screen HMI devices ever been in the market. Touch Screen Controllers enable you to monitor system status, control applications, send and receive alarm information and much more. 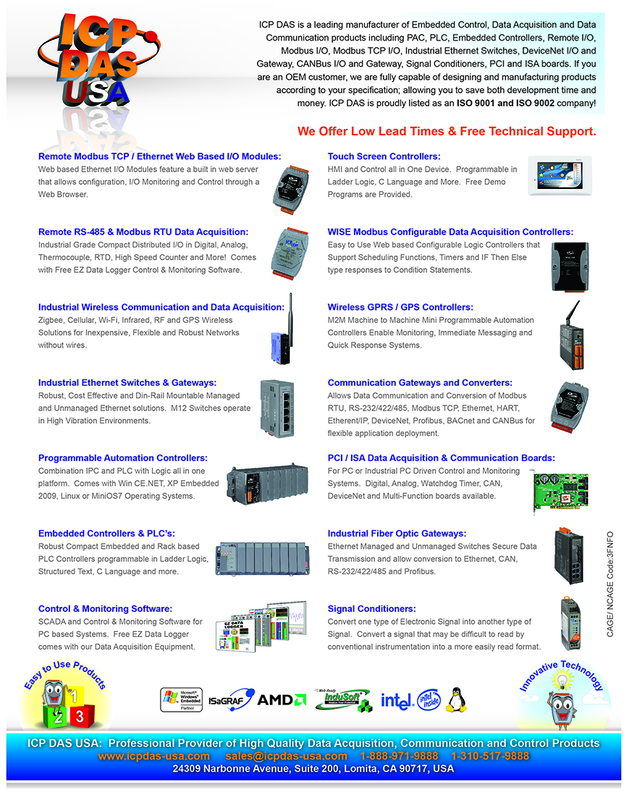 ICP DAS USA offers RS-485 Modbus RTU, Ethernet based Modbus TCP based Touch Screen PLC's that come with a free Ladder Logic and C Language based programming environment. They can be used in home automation, cold storage, food and beverage, energy and in most industries. This works well as an HMI for my control panel for an energy monitoring system. Are there specific power meters you are using in your application?